The Symptoms: In August 2006, a rare and potent strain of Escherichia coli, O157:H7, began spreading across 26 states and into Canada, sickening more than 200 people during a six-week span. Many of the victims suffered debilitating kidney damage, and the bacterium claimed the lives of two elderly women and a child. Using a DNA-fingerprinting system, epidemiologists at the federal Centers for Disease Control and Prevention matched bacteria in stool samples of hospitalized patients with pathogens in specific bags of "ready to eat" Dole spinach. The infected greens had been processed during a single shift earlier in August at a plant in San Juan Bautista, Calif.; the spinach had been harvested in Monterey and San Benito counties. What followed was one of the largest product recalls in U.S. history: On Sept. 14, 2006, the Food and Drug Administration told Americans not to buy or sell any bagged or fresh spinach. The advisory lasted until Sept. 22 and cost the spinach industry an estimated $100 million in lost revenue. The Disease: The 2006 E. coli outbreak was the ninth in the past decade that could be traced to California&apos;s Salinas Valley, which produces two-thirds of the nation&apos;s spinach. The FDA and the California Department of Public Health had long warned big industry groups such as Western Growers Association, whose workers in California and Arizona handle nearly half the nation’s fresh fruits, vegetables and nuts, to implement safer manufacturing and sanitation practices. But since 2003, the FDA&apos;s food safety division has seen its budget chopped nearly in half, to $25 million. As a result, safety tests for U.S.-produced food decreased by almost 75 percent between 2003 and 2006, according to an Associated Press analysis of FDA statistics. That means FDA officials have frequently lobbied the industry to, in effect, regulate itself. As Robert E. Brackett, director of the FDA&apos;s food safety program, told The Washington Post: "We have 60,000 to 80,000 facilities that we&apos;re responsible for in any given year. (Manufacturers) have to build safety into their products rather than us chasing after them. We have to get out of the 1950s paradigm." The Snake Oil: Prodded by government agencies, Western Growers began drafting a document called the Leafy Greens Marketing Agreement, which required all signatory handlers to purchase produce only from farmers who adhere to its rules. Leafy greens were defined as everything from lettuce (iceberg, romaine, green leaf, red leaf, butter and baby leaf) to escarole, endive, spring mix, spinach, cabbage, arugula, kale and chard (even though these last two are normally cooked and have never been implicated in a disease outbreak). The rules themselves — drafted by an advisory board consisting mostly of representatives from the bigger buyers and handlers — soon became the subject of fierce debate among farmers, conservationists, scientists and state officials. The proposed measures required growers to tear down hedgerows and other "riparian buffers" on their property and erect fences around their fields. The rules were aimed at eliminating wildlife (even lizards) from farms to reduce the risk of animal feces seeping into the water supply. Tom Nassif, president and CEO of Western Growers, hailed the regulations: "We believe this agreement can serve as a model for the nation in our quest to enhance the food safety standards in this country." Indeed, late last year, Sen. Dianne Feinstein, D-Calif., introduced an amendment to the Farm Bill that would have made it possible for California&apos;s self-regulatory rules to become mandatory for leafy green vegetables nationwide. But when her amendment met with a barrage of protest, Feinstein quickly withdrew it. A Second Opinion: Since 1999, according to USDA data, 98.5 percent of E. coli O157:H7 illnesses from leafy greens in California have been traced to fresh-cut, "ready to eat" bagged salad. Scientists believe there are several reasons: The ingredients of fresh-cut salad are sourced from multiple large farms, a method that increases the risk of cross-contamination. As noted food author Michael Pollan wrote in The New York Times shortly after the 2006 outbreak: "The plant in question washes 26 million servings of salad every week. In effect, we&apos;re washing the whole nation&apos;s salad in one big sink." Processing fresh-cut produce also heightens the possibility of bacterial contamination because slicing into the produce ruptures the outer layer of the leaves, creating openings for contaminants. That fresh-cut salads are placed in plastic bags, which provide the perfect environment for bacterial growth, doesn&apos;t help. But the Leafy Greens Marketing Agreement focuses mostly on farming, not handling, and applies the same standards to all operations, even smaller farms that do not process greens but sell them directly to consumers, farmers&apos; markets, wholesalers and restaurants. What’s more, opponents argue, not one of the agreement&apos;s requirements is scientifically proven to reduce E. coli O157:H7 bacteria levels, whereas studies have definitively shown that removing hedges and green perimeters allows manure, placed on fields as fertilizer, to run off into — and contaminate — streams. In fact, sustainable farming practices that encourage microbial life in soil have actually been shown to decrease the threat of E. coli, which is less likely to survive when competing with other microbes. Follow-up Appointment: The USDA spent most of December soliciting public comment on its industry-driven proposal to allow packers, processors, shippers and marketers to use a federal agreement to certify their leafy greens; a staggering 3,500 comments poured in. One "no" responder is Judith Redmond, the co-owner of Full Belly Farm in Yolo County, Calif., and the president of the Community Alliance with Family Farmers, an advocate group. "We&apos;re not just a group of farmers that doesn’t want to be regulated," she says. "But having buyers set the rules for an on-farm situation is highly problematic. The buyers aren’t often familiar with the reality of agriculture." And the reality, Redmond says, is that the rules in the marketing agreement were already being followed by some of the same large farms that processed the tainted greens. "The marketing agreement is more of a public relations effort than a scientific attempt to address a public-health problem," she adds. Or as Charlotte Vallaeys, an analyst at the Wisconsin-based Cornucopia Institute, puts it: "The aim of these rules seems to promote sterile fields that support few forms of life, except for the leafy greens." Toward a Cure: While the USDA considers how — and whether — to act, Redmond is left to rue the sad lack of knowledge about E. coli. "The level that&apos;s allowable in water was taken from an EPA study in the 1970s for body contact — if you&apos;re swimming in water with this much bacteria in it, you&apos;ll get sick," she says with a sigh. "We don&apos;t have data on what level of E. coli is safe in water that’s being sprayed on spinach. "We need a public database that tracks the presence of this very dangerous pathogen in surface water. That would be a lot less dangerous than building fences, clearing out hedgerows and making more water supply problems in the process." Beyond a program to monitor E. coli in water, Redmond argues, the key to combating it in leafy greens lies in the animal kingdom — and, more specifically, in cow manure fertilizer. "The more we look at it, the more we reluctantly have to admit that the reservoirs of E. coli are in cattle — pigs, geese and deer are just diversions," she says. "Certain individuals in a (cattle) herd shed very much, others very little. But there are very interesting prospects for research in the cattle industry, and they have a stake in this as much as leafy greens growers do." Then there&apos;s another possibility for reducing E. coli illness: irradiation. 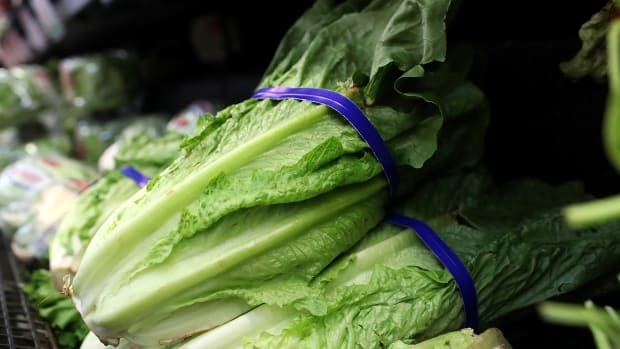 Long a widespread, but costly, practice in Europe, studies in the U.S. have shown that irradiation of leafy green vegetables gets rid of most bacterial contamination, including E. coli, and the treated greens are largely indistinguishable from untreated produce. Meanwhile, several national studies are under way to determine whether chlorine baths or natural antimicrobial agents could work in conjunction with irradiation.